Last week, a group of ice-fishermen were happily pursuing their passion Wisconsin’s Green Bay (for you non-Wisconsinites, this is a body of water as well as a town that hosts a once-great football team) when a large tanker pushed up the bay. The ship was far enough distant that the fishermen never saw it, but the resulting wake carried under the ice and broke off a giant slab…the very one holding the ice-fishers. Thankfully no one was injured or drowned, and the party was rescued after many anxious moments floating about. The prospects for this buck—riding a riverine ice flow somewhere equally cold—seem less cheery. Though the whitetail appears healthy at this stage of the voyage, what’s his next move? Wait until the slab rams into a larger, stouter one and skip to safety? Pitch out into the current and make a swim for shore? Whitetails are incredibly nimble on many surfaces, but ice is not one of them; every winter deer are rescued after wandering onto lakes or shelf ice and exhausting themselves trying to escape. So what’s this buck to do? And does anyone know the origin of these pics? If Santa isn’t a deer hunter he at least gets what we do. In each of the last few seasons the Jolly One has jammed a tree stand in my stocking. This year? Climbing sticks, an antler mounting kit, and even some camo seat covers for my truck. Guess I was good ‘nuff the past year! 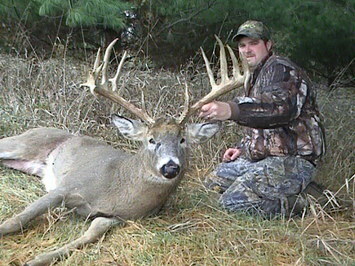 Of course, if Santa really wanted to treat me right, he could send a buck like this past my stand someday. This 23-point buck was shot by 20-year old hunter Brandon Green near his home in Mt. Jackson, Virginia. The monster non-typical grossed over 208" B&C. Congrats to Brandon! So how ‘bout you guys and gals? Get any great deer hunting gifts this year? I’d love to hear about ‘em! My wife and kids are Christmas lights fanatics. If it glows, twinkles or pulsates, they become slightly feverish and highly giddy. Holiday decorations are also known to incite the reverent “oohs” and “aahs” normally reserved for fireworks. Naturally, this condition has forced me to hang numerous electrically-driven phantasms on the eaves and porch railings surrounding my home. Next winter, I am going to shock them all and volunteer to take this decorations mania to new and loftier heights. I submit the following as Exhibit A, and hope to have something equally inspired and artistic displayed at the Bestul home next winter. Perhaps my Buck Tracker friends can supply me with further inspiration? In any event, I wish you all a Merry Christmas and thank you for dropping in to my electronic deer camp from time to time. Anyone still hunting out there? 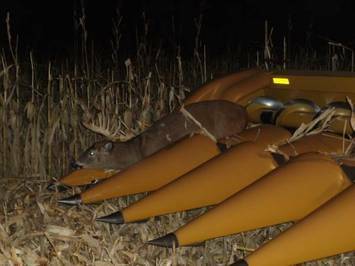 OK, this certainly isn’t hunting…but it is a unique buck “harvest.” The whitetail in the pics below met his maker in the form of a Midwestern combine. I think the photos are from Iowa, but haven’t been able to verify that. The nice buck managed to somehow get tangled in the combine heads and was dragged for some distance before the machine could be shut down and the animal dispatched. Apparently one of the farm workers took the buck so the meat wouldn’t go to waste. I’ve lived in the Midwest my entire life and have never heard of this before. It’s not unusual for fawns to get killed when farmers make first-crop hay in June, but this is perfectly understandable as the primary survival mechanism of these newborns is simply to lay still and hope danger passes them by. Mature bucks are notorious for holding tight to avoid danger, but they’re usually wise enough to know when it’s time to bail. Maybe there was something wrong with this buck’s hearing? 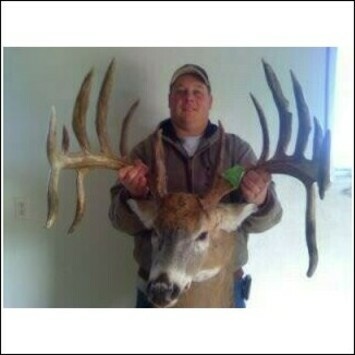 Note: In my last post I put up a photo of a huge Kansas buck of unknown origin. Fellow FS writer Steven Hill emailed me yesterday and said he’d talked to the hunter, who is Chad Christie. 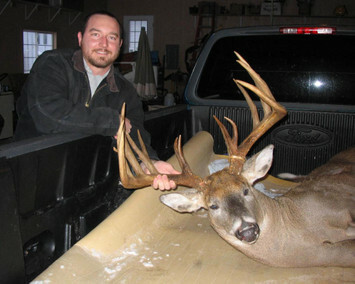 Chad shot the gigantic buck on December 5th, the 3rd day of the firearms season, on his family farm south of Lawrence. Chad says the buck scored “roughly 241 inches” and should rank among the top non-typs in that state. Congrats to Chad! The first buck is actually a call for help. The multi-drop-tined monster below is said to be very real, was shot in Kansas, and (again, supposedly) killed by a non-resident hunter. That’s all I know. The pic has been floating around for a few days, and though I usually can pick up a lead or two on a deer, this one remains a mystery. If anyone can tell me anything about this buck (other than that it is simply huge), I’d be grateful. I guess the young man was paying attention in class, after all! Congrats, Mr. Ernst! BuckTracker: You're Such A Freak! I’ve covered freak whitetails in this space before (including antlered does and cactus bucks), but nothing—in my mind—that compares to the deer below. This whitetail arrived in a Maryland taxidermist’s shop recently and may very well be the strangest set of antlers I’ve seen. This buck’s antlers seem to be fused at the base. 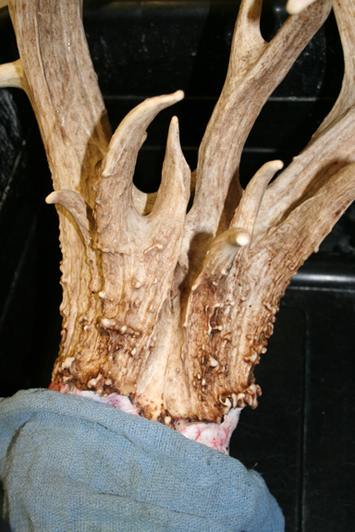 Indeed, even some of the “kicker” and “sticker” points growing well above the antler bases have grown together, creating a kind of huge, single “horn” that sprouted from this buck’s noggin. I know, I know…someone is going remind me that deer grow antlers, not horns…the difference being that antlers are shed and regrown each year. I get that, up, down and sideways. I also propose that this is one whitetail that—had he not been killed by a hunter—would have wished that the monstrosity between his ears would have remained firmly in place come late-winter. 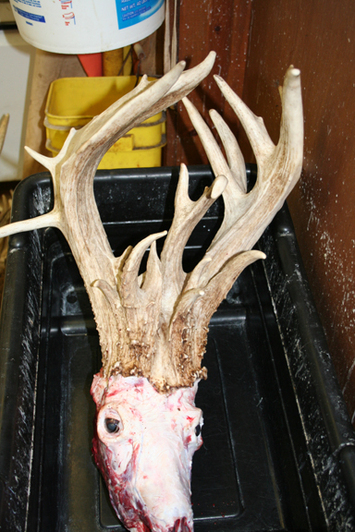 What would that poor fella have looked (and felt) like when he shed this antler? Antlers? Horn? BuckTracker: Way Up in the U.P. For the last several years, Michigan has taken back seat to several of its Midwestern neighbors (Iowa, Illinois, Kansas, etal.) known for their big-buck reputations. This, despite the Wolverine State’s long and storied reputation as a whitetail hunter’s state; when I covered the Great Lakes region for F&S’s regional pages (remember those?) some of the most knowledgeable and passionate deer hunters I interviewed came from Michigan. Well this buck—shot near the Upper Peninsula (U.P.) town of Newberry—should remind folks that Michigan can still produce a world-class whitetail. While the information I have is spotty, the buck was apparently green-scored by a B&C measurer at 197-3/8”, and sported 14 points, 27” main beams and a 24” inside spread. Apparently the buck was a “migrator” (UP bucks often leave their summer/fall home range and head toward wintering areas close to Lake Michigan) and was captured on trail camera three days before it was killed. 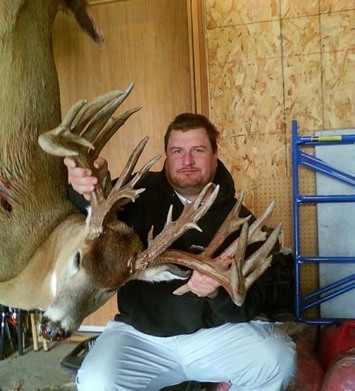 Should that green score hold up, this UP giant will rank among the state’s largest whitetails ever shot by a hunter. Even if it doesn’t, I feel this is one of the prettiest typical bucks I have seen this fall. Bucktracker: Can you say “Monster”? With the first of two Iowa shotgun seasons winding down, I figured pics of some huge Hawkeye bucks would start circulating. My hunch proved correct when a friend shot me the following photo today. According to the accompanying story, the buck was shot by Des Moines resident Chris Wood while he and buddies from Perficut Lawn Care were making a drive near Bedford, Iowa. The buck sports 33 scorable points, plus a drop tine. Though Wood will have to wait 60 days to have the rack officially scored, the buck was green-scored at 264-0/8”. If this score holds, the buck would be the new #2 buck in the Iowa record books. This fall, my home state of Minnesota took the admirable step—in my opinion—of lowering the minimum hunting age for big game seasons. 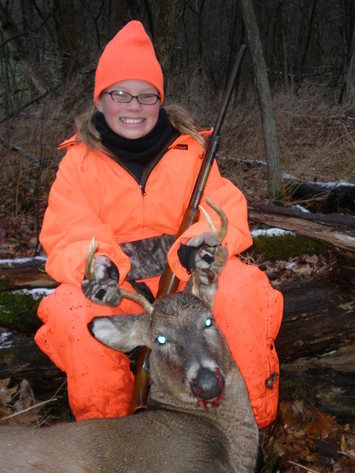 This year, hunters as young as 10 could participate in the firearms deer season. They must be accompanied (read; kept at arm’s length) by a licensed adult mentor. The young hunter did not need to have passed a hunter’s safety class, but would need to do so by age 12. Just this weekend a friend (my daughter’s former 2nd grade teacher) pulled me aside at a dance recital and asked “do you think this is a good idea? Letting 10-year olds hunt?” I said that, providing the 10-year old was eager, physically big enough to handle a gun, and escorted by a mentor of sound judgment, the idea was a good one, indeed. Better yet, I could point to an excellent example. Brooke Johnson is an 11-year old 5th-grader who attends the same school my kids do; Rushford-Peterson elementary. Brooke and her father Brent were hunting Minnesota’s first firearms deer season when Brooke shot this fine 6-point buck. My young daughter (also named Brooke) was standing by me when Brooke told me she’d shot her first deer. After we congratulated her, my Brooke tugged at my sleeve and said “I want to do that next year!” Well I would like her to do that next year to, and I thank Brooke Johnson—and the Minnesota DNR—for inspiring my young daughter in such fine fashion!